Dealing with stress, anxiety and anger are important skills to learn, but not all kids learn those strategies naturally. 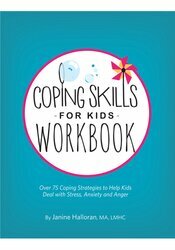 The Coping Skills for Kids Workbook can help teach children to calm down, balance their energy and emotions, and process challenging feelings. Author Janine Halloran, LMHC, shares over 75 innovative, fun and engaging activities developed from her experience in schools, outpatient mental health clinics and as a mother. Loved by counselors, educators and parents alike! !